The Little Nell elicits interest and curiosity from those intimately familiar with the hotel or simply by reputation in the press and among the treasured guests. Many inquire about its history and how it has come to be known the world over for graceful service, award-winning wine and cuisine, and sense of place, set just a stone’s throw from Aspen Mountain. In reflecting upon The Nell’s origins, the most common thread is a personal connection felt by discerning guests and embodied by caring staff. Over the course of three decades, there have been three leaders of The Nell, each responsible for significant impacts upon the hotel. While it’s grown and shifted with the times, it’s clear that a shared goal among this lineage of Eric Calderon, John Speers and Simon Chen has remained the same – to provide thoughtful and anticipatory service, bringing guests back from generation to generation. 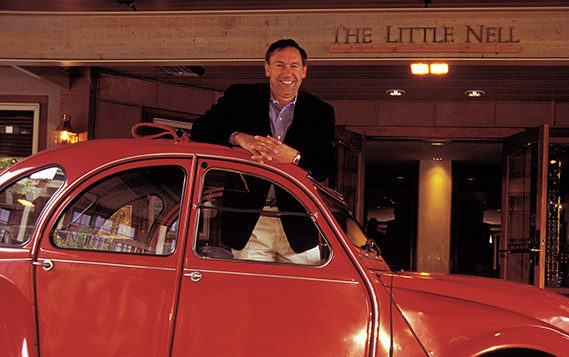 The Little Nell’s history began on Thanksgiving Day 1989 when then-General Manager Eric Calderon greeted the very first guests in his hospitable manner. 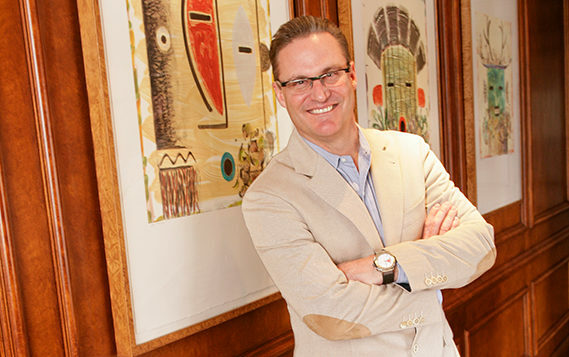 Eric’s vision in creating a European-style hotel with such services as the ski concierge, luxurious suites, and an emphasis on exceptional food & beverage poised the property for success. The following excerpts are from The Nell’s past and present leaders. Read on to see their greatest successes during their tenure. “We opened our doors to a sold-out house of prickly Aspenites for a dinner dance and overnight ‘pajama party’ to raise funds for the hospital. What were we thinking?! Thankfully, the event was an enormous success, and even though we all collapsed the next day, it set the tone for what was to become a wonderful and supportive community relationship that continues to this day,” Calderon recalls. The news of Calderon’s departure in 2007 for another opportunity in California left a hole in the hearts of guests and staff, though his part-time residency in Aspen has translated to occasional visits to the hotel throughout the year. The search for a replacement for Calderon was lengthy, resulting in the hiring of John Speers. His focus on food & beverage led to the development and expansion of the hotel’s restaurants, while an emphasis on training was recognized with continued awards and acclaim, and the project of a grand remodel of all guest rooms and suites took place. “He had recently taken on the concessions at Citi Field Stadium – home of the NY Mets and he invited me for a behind the scenes tour of Shake Shack to see how we might adapt these for the Sundeck on Aspen Mountain. The lines were impressive and l quickly realized Aspen skiers would never wait in line for an hour for a hamburger. The following day, Danny was hosting the Big Apple BBQ Block Party in Madison Square Park. He invited me to join the event, which drew nearly 300K visitors over a two-day period, to experience the best pit masters from around the country. The event included live music, cooking demos, and plenty to drink. While I was disappointed to realize Shake Shack wasn’t a viable option, I knew we could do a version of the Big Apple BBQ in Aspen. Danny was in agreement. “The Little Nell Ski Concierge was a truly innovative introduction that has continued to delight guests after nearly three decades. When I arrived, I noticed the location was void of activity during the summer, and it seemed like there was a better opportunity to create a unique guest experience during those months. Working closely with Justin Todd (then-Sales & Marketing Director), we created The Little Nell Adventures. “My first experience at Ajax Tavern was during the 1998 Aspen Food & Wine Classic. It was the most popular restaurant in town with two levels and a kitchen headed up by Michael Chiarello of the Real Restaurant Group. It was an amazing spot, and I have so many great memories. When I returned to Aspen on June 14, 2007 – opening day of the Classic and my first day on the job at The Little Nell, I couldn’t believe that Ajax had lost the luster from earlier days. Real Restaurants had terminated its lease, and there was talk of converting the restaurant into banquet space. I quickly began lobbying to update the restaurant, securing the rights to the name ‘Ajax’ and the redesign. With the help of architects John Rowland and Sarah Broughton of Rowland + Broughton Architecture & Interior Design, we moved the bar and made the room more functional, while adding authentic tavern touches with a modern twist. We launched Ajax with a new logo and a fresh new menu with Chef Jim Butchart at the helm. The rest is history, the restaurant had nearly tripled its revenue by the time I left in 2013, and the success has continued to build. “After 18 years of successful operations, it was time for a complete refresh of the hotel’s guest rooms and public areas. I was fortunate to work closely with Paula Crown, who selected (interior designer) Holly Hunt to assist with the renovations and upgrades of the hotel guest rooms and the lobby of the hotel. It was fascinating to work with these two talented women, each offering a unique view and aesthetic that transformed The Nell to be relevant for the next generation of luxury travelers. Every detail was considered: from heated stone flooring in the bathrooms; seating areas with banquette and trestle table to create a multi-functional area for guests to enjoy a board game or work; and in-room dining. We worked with artists Caio Fonseca and Robert Kelly to create limited edition prints for all of our guest rooms and corridors, along with originals that were placed in The Nell’s living room. The new design was a modern take on the mountain environment with iron, leather, rich woods and custom designed furnishings that added a layer of richness and texture while maintaining an understated luxury aesthetic. Element 47 was a culmination of six years of thought and effort. Our goal was to transform the staid pink-hued Montagna Restaurant into an establishment that reflected our commitment to providing exceptional food & beverage experiences. 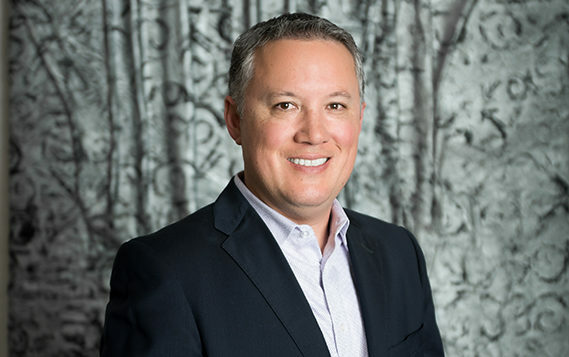 Simon Chen, the next leader of the hotel closed a loop, having worked at The Nell’s front desk in the winter of 1996/1997 at the start of his career in hospitality that led to the Caribbean, Florida, back to Colorado and on to California, before being appointed to the helm of the hotel. “Having worked with Eric back in the 90s, I always had this image in my mind of what a Little Nell experience should be. It had to be sophisticated, elegant, mouthwatering, incredibly warm and where the personal relationship was like no other. Both Eric and Barbara (Piper – hotel manager) were incredible stewards of The Little Nell, and I have always tried to take what I learned from them and continue to evolve what they and John created while not messing it up. As we started rebranding The Nell in the fall of 2013, the timing was perfect to reposition ourselves for the next 20 years. The team set about creating new adventures, menus, concepts and events that they wanted to experience and that would appeal to our guests and our community alike. We had our share of failures along the way, but for the most part, our guests have welcomed these changes with open arms. The most incredible part of this was that more of our staff began connecting with our guests in a completely new and relaxed way; whether it be riding up Independence Pass, skiing the backcountry or becoming a sommelier through our wine training. This had the most dramatic effect on our guests and our team. Friendships were born and relationships, strengthened. Throughout this entire time, the team’s commitment to gracious yet relaxed hospitality has never wavered, never losing sight of our core mission to care for our guests and each other. We still to this day don’t feel like we are special and thank our lucky stars that our guests love what we do. We invite you to join our Little Nell family – whether as a first-time guest, or returner time and again.